I’m not really here today. But you’re in good hands, so don’t panic. Nicola Morgan will look after you, seeing as she’s stopped off on her etour (Which is not the same as detour. I think.) to tell you, and me, about her new-old ebook, Mondays are Red. There was the time when a girl said, “I love your books.” “Oh, lovely – which is your favourite?” I asked, to be met by a blank stare, so I tried to help her out: “Maybe Wasted? Or Mondays are Red?” With a look of extreme witheringness, something I really should perfect myself, she said, “No, not your books. Your boots!” Of course. Mind you, I’m with her on the boots. Luckily, most readers are not Damien and I still get more positive emails about Mondays are Red than any other book, which is kind of lucky because it’s BACK! Damien, RUN – it’s coming after you! And that girl was so wise. Nicola has great taste in boots. Damien, hmm, not so sure… But someone has to meet the Damiens of this world, and who better than our Ms Morgan? This entry was posted in Authors, Blogs, Books, Education, Tim Bowler, Travel and tagged Nicola Morgan. Bookmark the permalink. Thanks, Bookwitch! One of those stories which is funny now but not so much at the time. Yikes! I haven’t met a Damien yet, thank god. And who knows, maybe the girl went on to read the book on the strength of the boots? 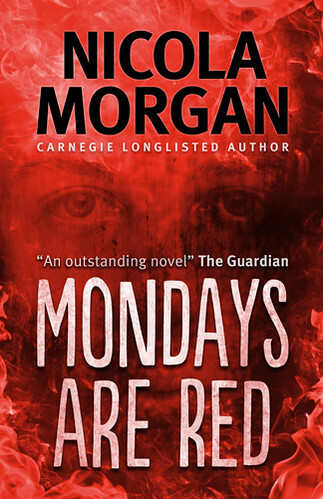 Anyway ‘Mondays Are Red’ sounds like classic Nicola Morgan – thrilling and chilling. OK, maybe I do sympathise. But only as long as she doesn’t get too bloody. If you lot are very very good today, I might just review Mondays are Red tomorrow. Except, you know, Mondays have always been blue as far as I know. In those boots? I think not. Trust me, Bookwitch, she can run VERY fast in those boots. Especially if they’re her pointy ones. Be afraid. Be very afraid. And thanks for making me laugh, Crabbit One. PS: Damien is quite wrong. Mondays are Red is not *shite*. It’s brilliant. Damien was too young. I disliked a Graham Greene at a very green age. Lucky for you that you only got it once! Dan – The Omen? Is that in there somewhere? A preternaturally naughty child called Damien? I’m so glad Mondays are Red is available again because I’m reading it now and loving it. It’s hard not to feel isolated down here in Oz. Thank goodness for ebooks with no geograhic restrictions! Or should it be geographical? See, this is why I need an editor. Depends. Did you study geograhy at school? Don’t be daft! I can barely switch on the Kindle.